In this paper we extend the agglomeration model of Ciccone (2002) to the level of industry. We then test this model using panel data for six sectors on regional level data for 27 EU member states. Our results for the aggregate economy confirm the estimates of Ciccone (2002). For our full sample of countries the sectoral level results also indicate significant agglomeration effects, with the exception of agriculture. 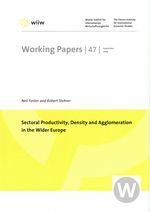 Considering differences in the extent of agglomeration effects between new and old EU member states, however, leads to the conclusion that agglomeration effects tend to be stronger at both the aggregate and the sectoral level for new member states.